"Namen" redirects here. For the village in Iran, see Namen, Iran. For other places called "Namur", see Namur (disambiguation). Namur (French pronunciation: ​[namyʁ], Dutch: Namen (help·info), Nameur in Walloon) is a city and municipality in Wallonia, Belgium. It is both the capital of the province of Namur and of Wallonia, hosting the Parliament of Wallonia, Walloon Government and administration. General Jean-Baptiste Cyrus de Valence's column laid siege to the city on 19 November 1792 during the War of the First Coalition and, after 12 days, the city surrendered on 1 December and its whole garrison of 3,000 men was taken prisoner. France invaded the region again in 1794, annexing Namur and imposing a repressive regime. After the defeat of Napoleon in 1815, the Congress of Vienna incorporated what is now Belgium into the United Kingdom of the Netherlands. Belgium broke away from the Netherlands in 1830 following the Belgian Revolution, and Namur continued to be a major garrison town under the new government. The citadel was rebuilt yet again in 1887. Namur was a major target of the German invasion of Belgium in 1914, which sought to use the Meuse valley as a route into France. On August 21, 1914, the Germans bombarded the town of Namur without warning. Several people were killed. 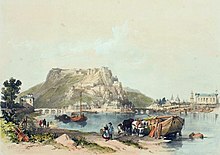 Despite being billed as virtually impregnable, the citadel fell after only three days' fighting and the town was occupied by the Germans for the rest of the war. Namur fared little better in World War II; it was in the front lines of both the Battle of the Ardennes in 1940 and the Battle of the Bulge in 1944. The town suffered heavy damage in both wars. 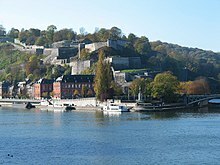 After the creation of the Walloon Region, Namur was chosen as the seat of its executive and parliament. In 1986, Namur was officially declared capital of Wallonia. Its position as regional capital was confirmed by the Parliament of Wallonia in 2010. The town's most prominent sight is the citadel, now demilitarised and open to the public. Namur also has a distinctive 18th-century cathedral dedicated to Saint Aubain and a belfry classified by UNESCO as part of the Belfries of Belgium and France which are listed as a World Heritage Site. The Couvent des Soeurs de Notre-Dame used to contain masterpieces of Mosan art by Hugo d'Oignies, currently presented in the Musée des Arts Anciens (Rue de Fer). 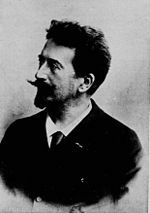 Elsewhere there is an archeological museum and a museum dedicated to Félicien Rops. Namur possesses a distinguished university, the University of Namur (previously known as the Facultés universitaires Notre-Dame de la Paix, FUNDP), founded in 1831. The University of Louvain (UCLouvain) also has several facilities in the city through its UCLouvain Namur University Hospital (CHU UCLouvain Namur). Since 1986 Namur has been home to the Namur International Festival of French-Speaking Film. A jazz (Nam'in'Jazz) and a rock (Verdur Rock) festival both take place in Namur annually. The annual Namur cyclo-cross race, part of the UCI Cyclo-cross World Cup, takes place on the hills around the citadel. St Aubin's Cathedral is the only academic Late Baroque cathedral in Belgium. The horse Bayard carrying The Four Sons of Aymon, created by Olivier Strebelle for Expo 58. Count Edouard de Woelmont, Belgian Canon. ^ a b Planet, Lonely. "History in Namur, Belgium". Retrieved 9 November 2018. ^ Décret instituant Namur capitale de la Région wallonne (PDF). Namur, Belgium: Walloon Regional Council. 11 December 1986. Retrieved 15 September 2015. ^ Décret instituant Namur comme capitale de la Wallonie et siège des institutions politiques régionales (PDF). Namur, Belgium: Walloon Parliament. 21 October 2010. Retrieved 15 September 2015. ^ "Belfries of Belgium and France - UNESCO World Heritage Centre". whc.unesco.org. Retrieved 2010-10-20.